Peaceful, picturesque Lake Lily has had a swashbuckling past. It was a prized watering hole for the Kechemeches, the Native Americans who summered and hunted on the Jersey Cape. When they were pushed out by whalers and farmers in the 1700s, the lake languished in the tangled wilderness known as Stite’s Beach. It was hidden by twisted trees and brambles and locals seldom ventured toward its shores. But word of its fresh water, so near the briny ocean and bay, spread across the Atlantic. The lake covers 13 acres and is one of nature’s most unusual gifts – as headwaters of a small watershed, all within walking distance of the Atlantic Ocean and Delaware Bay. There are legends of marauding British warriors and pirates of the high seas seeking unsalted drink from Lake Lily’s fresh waters. There is lore that pirates, the infamous Captain Kidd himself, anchored off the high dunes of Cape May Point and came ashore in small boats, hiking to the lake to fill their barrels. The lake then was about 10 feet deep. England in the late 1600s was attempting to control the Atlantic. The king paid privateers to attack enemy ships, thus bolstering the British Navy. Many successful privateers became pirates, including the fearless Scottish-born William Kidd. He seized French ships in the West Indies and hightailed toward American shores with his booty. Legend holds he buried treasure on easily accessible lonely stretches of the Jersey Cape, including Cape May Point and what is now Del Haven. There has arrived about 60 pirates in a ship directly from Malligasco. They are part of the Kidd’s gang. About 16 of them had quitted the ship and are landed in ye government of West Jersey in Cape May. I quickly rounded up two of these pirates and conveyed them safe to Burlington jail. The rest of them are still on board the ship which lies at anchor near ye Cape of this government. New Jersey Governor Jeremiah Basse, learning Kidd was lurking in a large sloop off Cape May, sailed down to capture the notorious pirate, but Kidd out-maneuvered him, heading north to New York and New England. Kidd’s voyage ended in Boston, where he was captured and sent in chains to England. He was hanged for sea crimes on a Thames River dock in 1701. The mystery of where Kidd buried treasure still lingers as children today learn his legend during lessons at Lighthouse park where once there stood a large twisted cedar tree known as Kidd’s Tree. During the war of 1812 British warships blocked the mouth of the vital Philadelphia shipping lanes on Delaware Bay. Raiding parties came ashore from both the bay and ocean to steal farm provisions and stop at Lake Lily to replenish their fresh water supplies. It was difficult gathering the local militia in time to catch the marauders. When the British fleet appeared off the bay in 1813 the locals got serious, forming a coastal militia. They camped on the banks of Cape May Point to watch for the Royal Navy sails and take up arms against British coming ashore. Robert Crozer Alexander writes in his 1956 Ho! For Cape Island! … the patriotic residents of Cape May, knowing that the British sometimes filled their ships’ casks with water from a spring-fed, fresh-water pond called Lily Pond on the point of the cape, dug a ditch through meadow, dune and woodland to let salt water into the pond thus rending the water unfit to drink. The ditch extended from the north end of the pond for a distance of over half a mile to Pond Creek, a tidal creek flowing through the salt marshes and emptying into Delaware Bay. This was no inconsiderable undertaking for the patriots who had only axes and shovels. After the war, the ditch was partially filled and the water in the pond became fresh once more. In 1910, at a place where trees had been chopped down to be cut in logs and cordwood, a part of this old ditch was disclosed passing through sand dunes,16 feet high. Traces of the historic ditch are said to be visible even today. Lake Lily lay in oblivion again in the midst of the Stites Beach wilderness until the 1870s. Devout Presbyterians Alexander Whilldin and John Wanamaker, Philadelphia dry goods tycoons, decided to carve a religious retreat from the 260 acres of virgin woods at Cape May Point. They hired noted British designer-engineer-surveyor James C. Sidney to create a community called Sea Grove. Lake Lily was a natural centerpiece for the development. Sidney decided there would be no streets, only Avenues, except for one service street and Lake Drive. 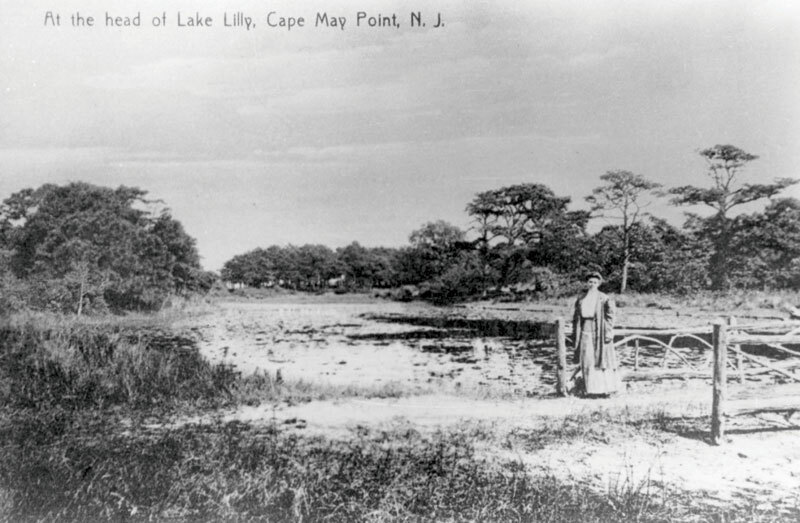 The drive encircled Lake Lily, offering, as Cape May Point historian Joe J. Jordan writes, “a pleasant track where nouveau-riche drivers could display their fine livery.” There were stables nearby where residents kept their horses and carriages, and visitors rented livery service. The man-made counterpart to the lake is Pavilion Circle, the large park designed by Sidney, which to this day is the centerpiece from which the avenues branch like spokes from the hub of a wheel. In 1875 when the Sea Grove development was completed, the fancy Victorian open air Pavilion seated 1,500 for religious and musical events. 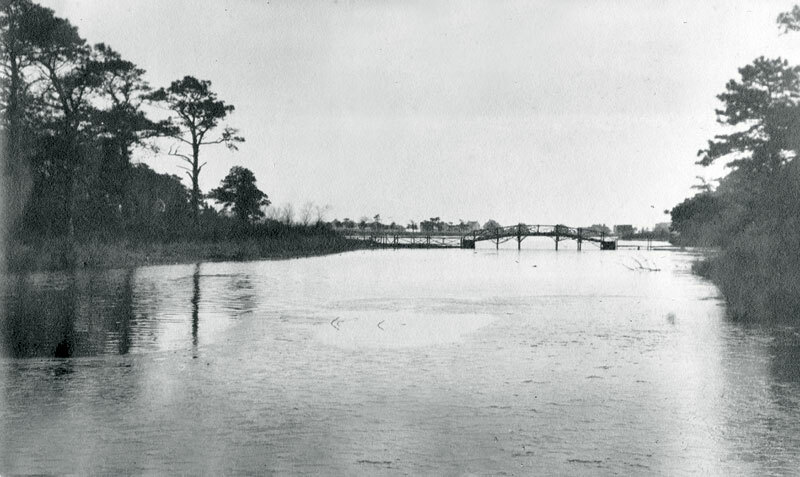 Also in 1875, as Sea Grove was being completed, Lake Lily was dredged to make it deep enough for boating. Sidney designed a charming boat house at the foot of Central Avenue. From there, small sail and row boats slithered across the glossy lake. The occupants in their Victorian boating attire created romantic scenes pictured on postcards of the day. There were weekly regattas and weekend picnics spread on the banks. A Sea Grove brochure bragged the lake was “stocked with perch, sunfish and black bass,” a complement to the carp and catfish that always beckoned boys with fishing poles. Nearby was “a handsome and commodious greenhouse, operated by an experienced florist, propagating a large number of flowers to decorate and add beauty to the grounds.” Town folk enjoyed excursions to Lake Lily, featured by the pious Presbyterians as wholesome fun compared to drinking, gambling and prostitution at neighboring watering holes. In winter, there was ice skating on the lake and a small business of cutting chunks of ice to supply the lakeside Walker Icehouse. The plain icehouse faced a fancy future. It was purchased by Dr. Randall Hazzard, a Pittsburgh physician. He enhanced his social position rehabilitating the icehouse into an elegant clubhouse called the Cape May Point Social Club. Joe Jordan writes in his Cape May Point Illustrated History: 1875 to Present: “The country club had many aliases. On any day the press might refer to it as the Lakeside Lodge, or Lily Lake Casino or Lakeside Villa.” The clubhouse opened August 11, 1899 with a reception and tea. Jordan says ladies gathered weekly for euchre and whist, there were monthly tea parties and members played golf, tennis, shuffleboard and ping-pong on the lawn. 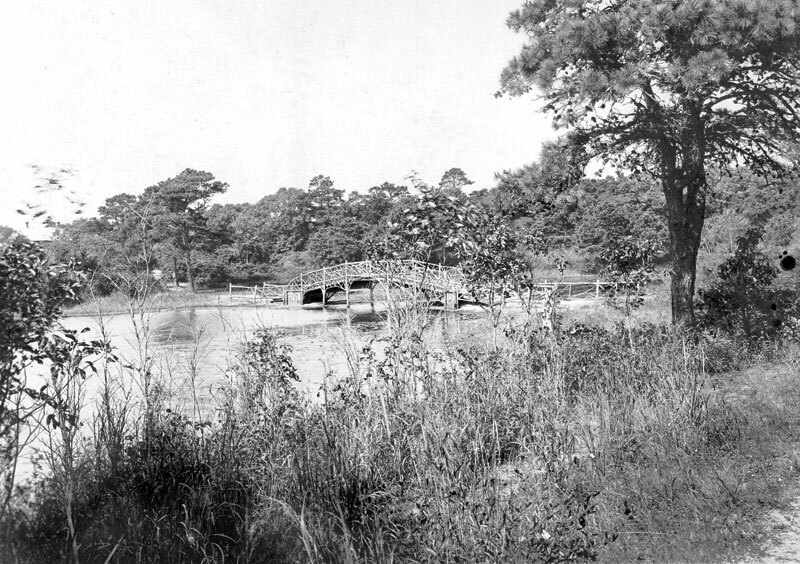 It was Dr. Hazzard who designed the rustic bridge overlooking the lilies at the northern end of the lake. The bridge was a favored subject for photographs and paintings, and the premiere spot from which to watch the annual water festival with all the boats and structures lit up for spectators who traveled from miles around. The Ferris family of Philadelphia purchased the lake and the Kechemeche Lodge on West Lake Drive in 1930. Sonia Forey, librarian at the Cape May County Historical and Genealogical Society, says that a member of the family, Jean Leon Gerome Ferris, was a rather famous artist. He painted and studied in Philadelphia and Paris, and in later years, worked at an easel in his lakeside studio. His widow, Annette, bequeathed the lake to the borough of Cape May Point in 1941. The nasty Ash Wednesday Nor’easter of 1962 pummeled Cape May Point for three days. Twenty-foot waves smashed into the dunes and flooded Lake Lily, polluting it with salt water. The namesake lilies were killed off, not to return for years. The lake itself was dying in the 1990s. Shaped like a big oval bowl, the lake is at the lowest point of a 120-acre watershed that extends east into a pond at the Cape May Point State Park and further east into the sprawling marshes of the Meadows bird sanctuary. The unusual geography is one of the reasons this area is one of the best bird watching spots in the world. Lake Lily always has been a rest and food stop for millions of migrating birds in the Atlantic Flyway. And that became part of the problem. Over the years, bird waste and silt diminished the lake, destroying its ecological balance. Citizens of the Point took action to create new life for the lake. Led by then-Mayor Malcolm Fraser, the borough, population 230, contributed $250,000 to more than $750,000 in state money. A contractor was hired in 2003 to dredge the lake in a complex system that pumped dirty water several blocks away to a basin at the old magnesite plant. A series of constructed sediment basins and dikes cleansed the water which was then pumped back into the lake, restoring its health. There were some bad days this past summer when record high heat waves and no rain resulted in a fish kill. The Friends work diligently to restore the fish population, reduce algae bloom and assure that drains, filters and pumps are working to keep the water fresh. Lake Lily and the bird watching it produces are reasons that Francine and her husband Joe chose Cape May Point as their retirement home 11 years ago. They live on East Lake Drive and often are awe-struck by nature’s surprises. “Last winter there was a frantic knock on the door,” says Francine. “A friend stopped by with a bird alert. ‘Look, look, there’s a bald eagle sitting on the ice in the lake.’ Just now,” she says, “a brown creeper flew from lakeside into my tree. The lake attracts Great Blue Herons and Great Egrets and in summer, when the lake is low, the little shore birds – sandpipers – run along the fringes” There are ducks, swallows, osprey and terns hunting the lake’s smorgasbord. Turtles bask on logs along the shore and frogs serenade into the night. Swan couples are committed and romantic, necking on the water, often spending a lifetime together. The male helps with the nest (clutch) and is very protective. “The lake male is very aggressive,” says Francine. “Last season he chased all the Canada geese.” They dared not set foot or wing on the lake. With his long beak and 10-foot wing span, you can’t blame the geese for beating it. Lake Lily, a miracle of nature, source of legends and traditions, lives on. Beautiful through the seasons, loved by wild fowl; friends and neighbors have joined together to keep this special place fresh and healthy the way it was created.